Heat olive oil in a large soup pot over medium heat. Add onions and celery and saute for about 4 minutes. Add garlic and continue to cook for 1 minute. Stir in tomatoes, tomato sauce and broth. Remove two cups of the soup mixture and puree in a standard blender or with an immersion blender. Add mixture back into the soup pot. Add oregano, basil and pasta. Bring to a boil, reduce heat and simmer for 10 minutes. Stir in beans and spinach and continue to heat for 5 minutes until pasta is al dente. 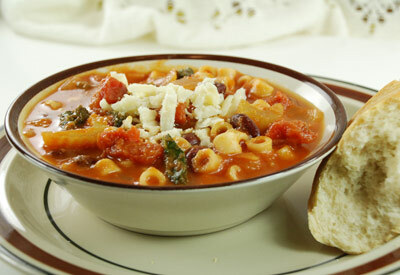 Ladle soup into serving bowls and sprinkle cheese over each serving.